Sam sketching in the galleries. Exploring how different styles of music inspire our practice as artists. We tried skeching to four different styles if music including Beethoven and Johnny Cash. One of the many perks of being a museum educator here at the DMA is having the opportunity to connect with amazing people in our North Texas community and beyond. Thanks to Tanya Krueger, one of our superstar volunteer docents, I’ve learned about the important work being done by The Stewpot, a community outreach program dedicated to serving homeless and at-risk populations here in Dallas. Tanya volunteers for the Stewpot Art Program, a special program that provides class time and art supplies for individuals looking to express themselves creatively, grow as artists, and support themselves through the sale of their work (be sure to check out opportunities to support the program by donating supplies or purchasing artwork – the artist receives 90% of the sale and the remainder goes back into the program for art supplies and field trips for the artists.) The Stewpot artists themselves are a remarkable group of people. Plan a visit to the studio and you’ll be struck by each artist’s individual style, creative drive, and kind spirit. Together with Cynthia Brannum, Stewpot Art Program Director, we’ve launched a monthly program for the Stewpot artists here at the DMA that includes a gallery discussion and lots of art-making activities. Speaking for myself, working with the Stewpot artists has been one of the highlights of my summer. Take a look at our first two visits! Making our own scrolls after visiting the Japanese galleries. A beautiful day to work in the Sculpture Garden. Two tiger paintings inspired by the DMA’s collection. Leon and his Zen-inspired landscape. Tanya sharing the story of Daruma in the galleries. It has been my great pleasure to work in the education department at the Dallas Museum of Art for the past three years. My position as the Program Coordinator for the Center for Creative Connections (C3) has been such a huge opportunity to expand my K-12 art education and museum studies masters degree. I have had the great challenge to expand my knowledge in the classroom by leading the hands-on adult workshops in C3, working with local artists on the development of programs, leading programming for hundreds of people, mentoring young artists, and working with amazing people who have helped me grow as an educator. And now, I am thankful for a new opportunity to teach K-6 art for Richardson Independent School District and will forever be grateful to the DMA for my experience. To close, I would like to say goodbye by remembering some of my favorite times at the museum. There are far more experiences to remember, but thought I would count just thirty-six–one experience per month of working at the DMA. 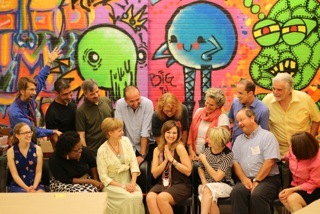 Meeting many artists and working with them to create dynamic workshops in C3. Co-teaching a creativity program for adults. Becoming friends with Meaningful Moments attendees John and Sue, and receiving my very own squirrel foot necklace! Coming up with crazy Creativity Challenges for Late Night. Working with studio art students from the University of North Texas to train them how to expand their practice by teaching workshops for adults. Being the loudest one in the Center for Creative Connections office. I loved being part of the Urban Armor graffiti camp with our teen specialist JC Bigornia and guest artist IZK Davies. Meeting one of my favorite pop-up artists Robert Sabuda, during a Late Night Creativity Challenge. Teaching a Think Creatively class and instructing participants to draw a work of art they hated. Reading my favorite Fancy Nancy book during summer story time. Leading a Creativity Challenge for our Meaningful Moments program. Sitting in front of Orange, Red, Red by Mark Rothko when I need to think about something important. Seeing people drop things into a work of art by Nobuo Sekine. Going bowling for our education retreat. Having a Task Party with the C3 Adults. Doing yoga after hours in the Cindy Sherman exhibition with Melissa Gonzales! Meeting so many talented adult visitors who have helped mold me into a better educator. Leading Creativity Challenges for J.P. Morgan; making them create a love story between two works of art and crafting what the baby would look like! My incredible work-pal who brightened my day by leaving notes, gifts, and encouraging words on my desk weekly. Giving impromptu tours to visitors of works of art in our collection. Hosting Wayang Kulit artists in C3. Holding Life Drawing classes in the DMA galleries. Meeting Taye Diggs and helping Shane Evans lead a drawing workshop in C3 during the BooksmART festival to promote their children’s book Chocolate Me! Hosting a poetry showcase with The Spiderweb Salon of Denton, Texas. I was able to hear many musicians and writers (many of whom were C3 visitors) respond through words and songs to an exhibition at the DMA. Taking creativity breaks in the Crossroads Gallery. Working with C3 Volunteer Robert Opel to create the vision for the C3 Adult Programs promotional flyer. Receiving a phone call that Think Creatively changed one of my visitor’s lives and he will never be the same. Having an incredible boss who took many chances by letting me run with my ideas! Making new friends and being challenged by my colleagues. Having access to see the Jean Paul Gultier exhibition anytime I wanted to. Meeting many new people every day. Working with Maria Teresa and experiencing how important art is to the community. Working with Lesli Robertson and Natalie Macellaio on The Motherload installation (opening September 2014) and the launch of parent and child summer camp called Side by Side. Thank you DMA for all the amazing memories. In thinking of an activity relating to the sculpture above for our June Studio Creations workshops, I kept coming back to the idea of costumes. The outfits, armor, and accessories worn by each of the three figures is amazingly detailed, and with Dallas Comic Con on the way, making cosplay accessories seemed like a really fun project. I’m going to show you how I made a “fin”-style gauntlet. But you can apply these directions to make whatever you want: helmet, tiara, jewelry, cape, etc. For the base of the gauntlet, I cut a piece of craft foam to fit the back of my forearm. I made a similar piece to encircle the back of my hand and palm. Optional: I used a heat gun to carefully heat and shape the foam. While it was still warm, I formed the pieces around my forearm and hand. You could also do this with a glass, tube, etc. If you want to skip this step, you can curl the foam without heating it–it just doesn’t hold its shape as well. I then cut more foam pieces for the armor plating. You can draw the shape directly on the foam with your sharpie or you could cut out a template to use from your scrap paper. Save the scraps of foam that are left over–these can be used for decorations later! Self-adhesive foam shapes work well for decoration, too. I then used a hot glue gun to put all of the pieces together. Double-sided tape works, too. You could use velcro or elastic to make a closure for the glove so that it stays on your wrist. In this case, I used the scrap foam to make some small studs that I will stretch rubber bands across to hold it in place. Keep in mind that craft foam is very thin, so this armor is purely for show! And again, you can make almost anything you can imagine with these materials. For more ideas, search “cosplay diy” and also check out this amazing tutorial. And don’t forget to come to the DMA to see Takenouchi no Sukune Meets the Dragon King of the Sea and to participate in Studio Creations! Studio Creations participants share their thoughts about Lynda Benglis’ work. Squeeze a small amount of gloss medium onto the painting surface. Using your squeeze bottles or cups, drop a little bit of paint into the medium. There’s no right or wrong way to do this so feel free to experiment! Try planning it out or putting the paint in randomly. Now try tilting your painting surface in different directions. The paint will start to run depending on the direction and angle that you tilt it. This is where the part about chance comes in–you only have a certain amount of control over the paint as it moves. Chance played a big role in the way that Lynda Benglis created Odalisque–she didn’t have any control over the paint after pouring it. Whenever you feel like it, add more paint. But be sure to drop it into the medium–otherwise, it could break off from the rest of the painting when dry. Continue adding paint and tilting the surface until your painting almost reaches the edge. When you are finished, let your painting dry for at least one day. If you added a lot of paint, it may need an extra day or two to fully dry. Afterwards, carefully peel the painting away from the painting surface–it should be plastic-like in consistency. Now try making it into something sculptural! Your painting can easily be cut and molded. Some ideas that came up during Studio Creations were: a mask, a bowl, a mouse pad, a jacket, and a sun catcher, among others. If you’d like to share your creation with us, feel free to send an image to jbigornia@dma.org and I’ll post it on our Flickr page. Almost sculptural, don’t you think? Your painting does not have to look a certain way. Have fun and experiment! For best results, I suggest using pouring medium instead of gloss medium. It’s a little bit more expensive, and it’s only made by Liquitex, but it was designed for projects just like this one and can prevent “crazing” in the paint. For super-duper results, mix a little bit of gloss or pouring medium into your paint before you start your project. One part medium to ten parts paint should be perfect. You can also try string medium! You can get different designs by letting the paint run in one direction for a while and then turning it in another direction. This is really good for making swirls, circles, etc. You can use a toothpick to create fine lines as well. Lots of other cool poured paint projects can be found online! Further questions? Feel free to shoot me an email!